As part of our continued efforts to provide the best events management solutions for WordPress, Modern Tribe has purchased GigPress, a popular and established events plugin aimed at musicians, comedians, and other performers. GigPress joins our illustrious lineup of events plugins including The Events Calendar, Events Calendar PRO, and Event Tickets. Our events plugins get along nicely with GigPress, and can be combined with existing show listings for a more full-service showcase of your performances. Add your show listings to a master calendar by importing a .csv file from GigPress. If you have our iCal Importer plugin you could also do .ics file imports. List individual performers at a festival by dropping a GigPress shortcode into a single event page. 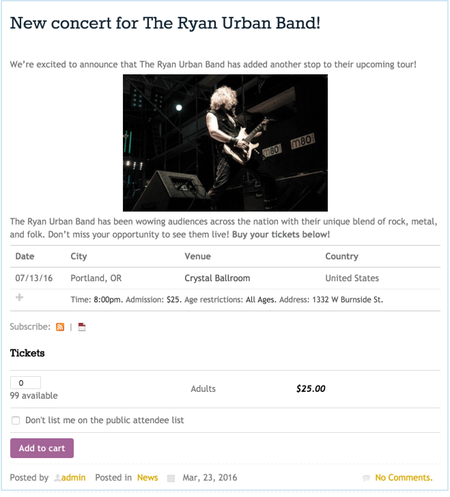 Link to an emebellished event page in the GigPress External URL field to give your fans access to show flyers, audio clips, and other content. GigPress is great for show listings, but sometimes you want to be able to feature other types of events. We’ve written a handy little mini plugin that allows you to show off your GigPress shows right on The Event’s Calendar’s Month View. Sweet diggity! Tired of sending fans off your site to buy their tickets? With our premium Event Tickets Plus plugin, you can sell tickets or collect RSVPs from any WordPress page or post, and keep users on your site from start to finish. Event Tickets Plus works with your favorite ecommerce plugin and has tons of great features for managing your own ticket sales. If all you need is RSVPs, check out our free Event Tickets plugin. We’re stoked to welcome GigPress into the Modern Tribe stable of plugins. GigPress will remain a free and open-source plugin alongside our core The Events Calendar and Event Tickets, with the same commitment to support. As for what the future holds, we’re eager to find out – and you can stay up to date by joining our newsletter. Keep on rockin’… we’ll be in touch!